I just realized that my "2019 Fund Drive" went a month short this year (usually do it for 3 months and only did 2, January and February). So we are reactivating the "Fund Drive" for the month of April 2019. We need help to cover at least a good part of the planned Tecsun PL-880 test sample cost (update review) along with usual funding for me to just be here. So if you appreciate “Dave’s Radio Receiver Page”, please consider a small donation. Does not have to be much (even a $ 1. or $ 2. US Dollar CASH donation sent via postal mail directly to me is greatly appreciated). See the green block on the main page on how to do this (PayPal is fine for monetary donations too). If you are in need my USA mailing address, please just ask me - send me a email…that is no problem at all (I don’t openly display this). My amateur radio address on QRZ is valid as well. Yes, working decent "Solid State" receivers / transceivers or other related radio equipment of value (as "pre-paid" donations) are also greatly welcomed. Please send me a email on what you have to offer. "Icom IC-R8600" N9EWO Information : Our "version 11.6" ICOM IC-R8600 "Wide Band" Receiver Review (click here). Includes testing of the SP-39AD Power Supply / External Speaker and added mode information including NXDN stuff (also 1.34 firmware updates). Icom released new IC-R8600 "1.34 firmware" on April 19, 2019 : USA 02 version linked here. •The MAC Address item is added in the Set mode. •The File Split function that can record the received audio, depending on the squelch open or closed status, is improved. •The Noise Reduction function is improved. •Fixed an issue where the RX audio level may change when the bass level is increased. IMPORTANT UPDATE : After additional testing 1.34 firmware audio distortion is NOT as good as 1.32. We say stay with 1.32 if you want the lowest audio distortion. If the AGC Audio Swamping bothers you and desire better NR performance (noise reduction) then use the new 1.34. Many may never hear this distortion depending on the external speaker used ! Remember we use 2 way speakers with our IC-R8600 (see review text) ! I must say it’s improved in a number of area’s. Some of the fixes were undocumented in the 1.34 update notes. - First the NR (noise reduction) has been improved. Going above #2 setting sounds no more like“R2D2”. NR is now a useful feature whereas before it was a utter disappointment. It now operates similar to the IC-7300’s NR performance. - The “AGC swamping bug“(that I call it) issue when tuning across super strong signals or strong static bursts has now been fixed with 1.34. Excellent news here and appears to have also improved weak signal recovery slightly. Only downside while zipping through mediumwave and shortwave MEMORY CHANNELS or VFO, we hear a disconcerting “pop” sometimes when we land on a active strong channel ,(this is quite annoying after awhile to our ears). - I even detect a slight added Bass kick with broadcast stations that have it (most noticed on the FM Broadcast band) with our Minimus 77 speaker. Yes we do indeed set the “Bass” tone setting up to maximum (+ 15) on AM/FM and SSB modes for our much preferred classic Realistic Minimus 77 two-way “hi-fi” speaker that we use with our IC-R8600. - After extensive testing, audio distortion while slightly better than 1.33, was still the best with 1.32. So if you want the lowest audio distortion on the HF bands..we say go with 1.32 even with the AGC swamping still present. - Provide a "second" VFO. - Make the RC-28 (Remote Encoder Knob) operate with the IC-R8600 totally standalone (without ANY computer connection as like with the IC-7610). I would understand an additional interface box and or cable / accessory may be required for connection to the receiver. - Allow 1 Hz tuning steps with the tuning knob (now this is only accessible with direct keyboard entry or computer / CI-V control). The IC-7300 HF transceiver can tune 1 Hz steps with the tuning knob. - Incorporate a REAL "Properly Operating" Synchronous Detector (instead of the less optimum "Synchrophase" type currently used). Or at least improve the current one with fading distortion. - Increase AM Mode bandwidth up to 12 kHz (or better yet 16 kHz). For MUCH improved audio with good band conditions. - Increase SSB Mode Bandwidths up to 6 kHz (or better yet 8 kHz). This would improve manual ECSS audio by leaps and bounds. Our "Updated-Expanded" AOR AR-DV1 Review Is Now Available : This took much longer than planned for a number of reasons. For one testing of the the v1812A firmware bugs (perhaps not important for many), Butel's ARC DV1 software bugs we discovered are now fixed (updated to Version 1.3 Build 001), and just general testing with the latest second sample. The "off frequency" issue was not present with sample # 2. This took MANY hours / weeks to compile, so please consider a small donation for my time and work ...."Thank You ". Will update this as required. UPDATES : Updated the firmware bug text near the bottom on the page (rewrite and new information). Our "Greatly Updated-Expanded" AOR AR-DV1 review is now available. New v1903A firmware (Apr 10, 2019). Our "Updated" SDRplay RSP1A Review Is Now Available : With the help of reader donations we were able acquire a late production test sample of the SDRplay RSP1A. This is test sample number two (first one was only borrowed for short time). SDRuno program is a winner (we tested the older 1.22 version). - Added a few screenshots of the software in the review (are not huge due to our limited bandwidth / space). - New 1.31 verson of SDRuno and version 3.03 of the API/HW driver, came out on Apr 09, 2019 (not tested). Please note that API/HW version 3.03 can only be used with SDRuno (not with other SDR programs such as HDSDR or SoDiRa). Good news is that the older 2.13 and 3.03 can coexist on the same computer. - New Preview 31 of SoDiRa was released on April 16th. New features : SpyServer added, Wavefile browser added, Recorder + Player improved. Restest of the Tecsun PL-880 ? : Have the audio SSB distortion issues truly been cleared up ? Uniden's NEW SDS200 Base / Mobile I/Q Scanner. HF RFI Generator - "Electronic Defrost Timer" : We recently had a defrost timer replaced in a near 20 year old refrigerator. 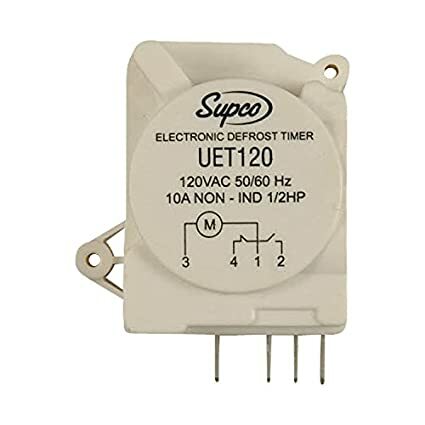 The mechanical one that was in it was replaced by the Supco model UET120 which is of a solid state design. It creates some pretty nasty SW/HF interference with it's internal switching power supply (as I was afraid of). But it could have been worse. It’s RF noise in my situation (and is at a pretty major level) is between 2200 and 4000 kHz. It drops off greatly after that with only a very low level spur or harmonics above up to around 20 MHz. Thomas Witherspoon of "The SWLing post.com" reports to me that between his refrigerator and freezer are the 2 worst HF RFI generators in his house. It appears that all new refrigerators / freezers are using these "el-cheapo" Chinese solid state "Defrost" timers now. These might seem more robust, but as I read around the internet they are not. Guessing are more prone to failure from spikes/power line surges ? Yeah, the new DX catch....the neighbors refrigerator. More nasty household appliance RFI woes for HF reception. This time it's a "Solid State" Refrigerator Defrost Timer. We experienced this UET120 model by Supco. Appears that "ScannerMaster" is no longer a USA AOR Dealer. Did the AR-DV10 fiasco have a play in this decision ? Indeed, many are not aware of the real information with the Satellit 600/650. As the article above did point out Max Grundig sold out to Philips in 1984. The “old” Grundig had absolutely nothing to do with the Satellit 600 or 650 (ditto for all models after including the Sat 700). Yes, they were designed by Philips and manufactured in a Philips plant in Portugal. The last “REAL” Grundig designed and German manufactured LARGE SW portable was the Satellit 3400 (and the Professional Satellit 3400) to 1984. My "RF Engineer" friend Pete Gianakopoulos KE9OA who has worked on many of the real Grundig “German “classics including the Satellit 3400, was not even that crazy about that model. Yaesu FT-70D Notes : A few notes from our Yaesu FT-70DR "Fusion" test sample hand held transceiver (sorry we are not planning a lengthy review on this radio). - Operates well enough all around with plenty of decent undistorted receive audio. - Fusion "Yahoo Groups" have reported excessive receive failures since it's release, that is internal speaker fails but still works with speaker mic OK.
- Internal microphone sensitivity between analog and fusion transmit audio is still far apart and Yaesu should consider separate TX level adjustments for digital and analog, otherwise TX punch is good. - Very good ergonomics and very easy to see LCD display and backlighting. - No extended receive above 579.995 MHz (nor MW or FM broadcast). - Receive coverage lacks SW broadcast (which the FT2DR has, AM mode only). - The biggest "Bug-A-Boo" with the FT-70DR involves "stand by" current when off. Many Chinese handhelds suffer from this bug and the Japanese made Yaesu FT-70D is nasty BAD here as well in our testing. It's receive current consumption in regular operation is OK provided it's RX LED's off and battery saver is in use (however the FT-2DR fares MUCH better overall here as shown in the specifications). ONLY way around the excessive "stand by current" bug is to totally remove the battery when not in use (a royal pain in the rump !). Yes, this is even after the recommended firmware update ! - Cabinet is on the "chubby wide" side. For anyone with small hands you know what I mean. Not easily placed in ones shirt pocket either (unless you are a lumberjack). - Included plastic antenna continues the Yaesu tradition here (that is a bit on the "ugly-thugly" side and only so-so performance). Attractive price these days but in our view one should consider the FT2DR model (right) instead (see text above). The TIVDIO V-115 (and it's relabeled variants) MP3 player does indeed have a "Shuffle Mode". The Discontinued Icom IC-R75 HF Receiver. - A SET MODE item is added to expand the transmission passband width for the SSB data mode up to "100 to 2900 Hz". - A SET MODE item is added to make the USB SEND/USB Keying function active immediately after USB port connection. The Menu structure is changed accordingly. - Other performance improvements and bug fixes. Icom released new 1.10 firmware on Sep 14 : USA 16 version linked here. - Remote control operation with RS-R30I. - Automatic backlighting is improved. - Some restrictions of program scan edge settings are eliminated. - Skip function is improved. - Duplex check function during the memory scan is added. - Duplex scan function is added. - Memory group and group link settings are connected. - Channel UP/DOWN is available across channel groups in the Memory mode. - Bluetooth® SCO Link can be automatically disconnected when there is no audio. - Volume of a Bluetooth® headset and the IC-R30 can be separately set. - Battery condition information is added. - The record file management system is improved. N9EWO's Review on the Icom IC-R30 is Available Here (version 2.6). AOR AR-DV10 Firmware / Drift and Other Major Issues : The receiver is manufactured by Yaesu (for AOR) and is sold in many parts of the world by Yaesu dealers including the USA. English owners manual can be viewed here. USA street price is $ 900.~ 1000. (price has dropped since it release with it's serious and continuing issues). Comparison between the AR-DV1 and AR-DV10. Our AR-DV1 review here, which has it's own bugs, but nothing like the AR-DV10 . It appears that the AM / FM Broadcast sections are using a one-chip radio IC in the AR-DV10 (like the IC used in the el-cheapo Chinese radios) ? It still uses super heterodyne circuits as indicated in the specification information, NO direct sampling is used that I can see (look at the block diagram in the brochure). It's NOT the same receiver architecture as the AR-DV1 (much different). UPDATE : Carl S. reports to us directly that his AR-DV10 sample has these shortcomings : Flickering display, extremely low audio, low sensitivity and yes the dreaded drift issue. Has not enjoyed 1 good monitoring session with it. Strong "Caveat Emptor" . Icom IC-7610 "Fan Operates in just Receive Only Use !" : The Icom IC-7610 "Direct Sampling" SDR HF Transceiver's receiver section draws around "3+ amps" of current just as with the elder IC-7600 model did (via information as indicated in the brochure). We of course had a gut feeling that the fan would operate in just RECEIVE ONLY use ? IMPORTANT UPDATE : Our concerns were found valid. Rob Sherwood NC0B reports to us that the IC-7610's internal fan does indeed cycle with JUST RECEIVE ONLY use !! So it's the same as with the IC-7600 fan operation and noise (our full IC-7600 review can be seen here). I for one will NOT be making a IC-7610 purchase now or in the future (it's off my possible purchase list permanently). But I'm sure for many (most) this trait will not be an issue at all. This is a VERY IMPORTANT factor and a total deal breaker for ME ! As we have already covered in our IC-7300's review, it's fan NEVER operates in just "Receive only" use. NO fan operation is REQUIRED with any "receiver" for our very sensitive ears to this kind of noise !! "Universal Radio" has Moved to a New Location as of Monday October 16th, 2017. "Universal Radio has moved its operations to a more efficient location here in the Columbus, Ohio area where we can continue to serve our loyal customers. This will be the fourth location change since Universal was founded in 1942. We look forward to many more years of serving the amateur and short wave communities which Universal Radio has done for 75 years. The new location is a 30-minute drive from the old Americana location." .